Europe.Bloombiz.com - Green Sap Sheet, Product by Best Green Life Co., Ltd. There are four elimination organs of liver, kidney, lungs and skin. These organs continuously take in nutrition and eliminate the remainder. When they work normally, the body will be healthy. If not, the body store the waste and become in abnormal condition and finally catch a disease. The sole of the foot is recognized as the place which reflects the whole body and has numerous acupuncture points. It affects the blood circulation and accumulates the waste which is not detoxified in other organs such as liver, lungs etc. That is why the foot is called as the second heart. When you apply green sap sheet on the sole of the foot, it can cure your pain. Because it absorbs the waste and sweat from your feet as if a root does. The changed pads into brown are the definite proof that your body was detoxified through the soles. When you apply green sap sheet on the sole, it helps to improve blood circulation, combat fatigue and stay healthy and clean and more energetic. The body accumulates toxins and unwanted matters every day in our bones and muscles, in our fat and in our organs. Improve your recovery from the fatigue with green sap sheet while you sleep. 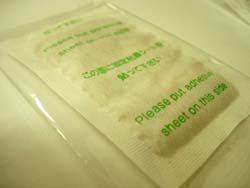 You can find the waste on the green sap sheet after being attached on the bottom of your foot during sleep. It is recommended to use while sleeping since it is inconvenient to use in the daytime due to waste from body. Using for 4 to 8 hours is recommendable but you can increase or decrease the using time case by case. 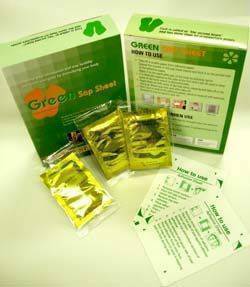 The body can be improved healthy condition and feel refreshed by using the green sap sheet regularly since the waste are absorbed through the feet.